I had hoped to be caught up with my CQJP 2015 blocks by now, but it's going a bit slower than I would like! This is my block for May! Each block starts off a little differently, some with the main motif, others with a seam. This one started with the curved stems with pink and yellow flowers. There wasn't much pink fabric on this block, so I knew I needed to pull it through the rest of the block in order to help it blend with the other blocks. To the right, I stitched a variation of one of my favorite feather stitch patterns. In-between the two, I used a vintage seam pattern using a chevron stitch and straight stitch in a variegated thread. I love the way it turned out and can tell that this will be a favorite! 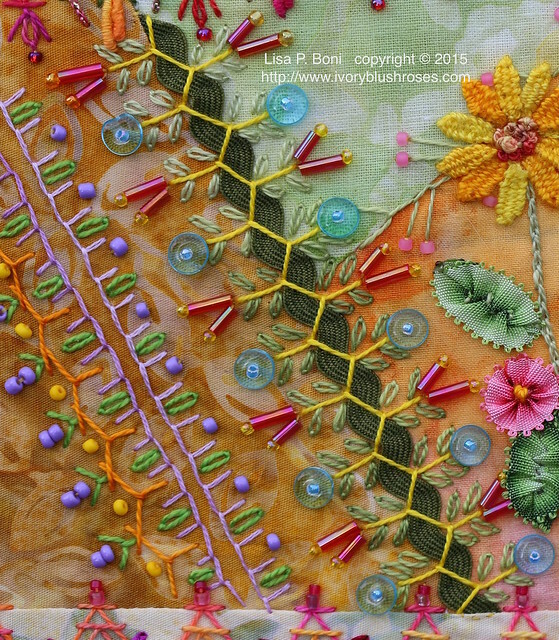 At the bottom of the block, I stitch a fly-stitch seam with lazy daisies added to create leaves and them some beaded flowers. Above it, I did a layered chevron stitch with some SRE embroidered flowers. Buttonhole stitch is one that I don't use very often, but I've found so many variations that I am determined to play with it a bit more. It layers so beautifully with other stitches such as this herringbone/cretin stitch combo. I also used cretin stitch to hold this block's bit of rick-rack in place and used more lazy daisies for leaves and a variety of beads as flowers. I've really come to love medallion type motifs. They lend themselves to so many possibilities! In the upper right corner I added a half medallion, once again trying to bring some of that pink through to the rest of the block. Below it, I used another favorite seam motif. The green turned out to be too dominating and I was able to lighten it up a bit to bring it into harmony with the rest of the block by adding the lighter green beads. The seam behind the main motif needed some embellishment as well, so I added a subtle feather stitch variation known as the MaidenHair stitch. It provided just the right element of interest. 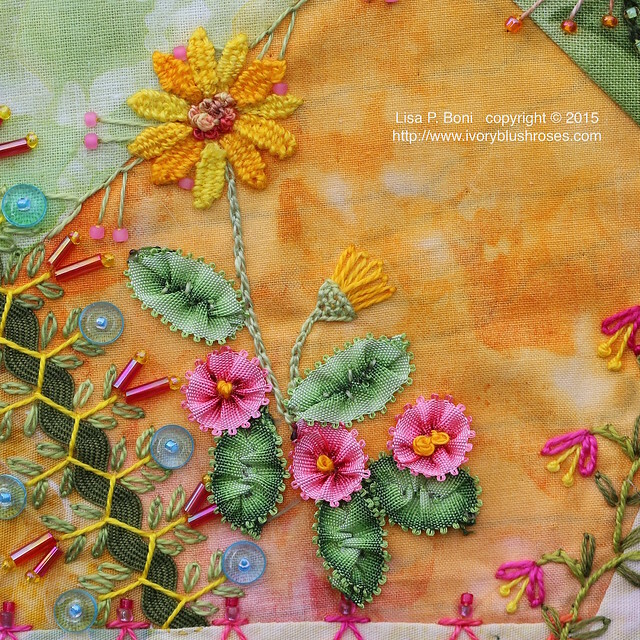 Along the top of the block I added a vining stitch with lazy daisies - and once again, a bit more of that bright pink! 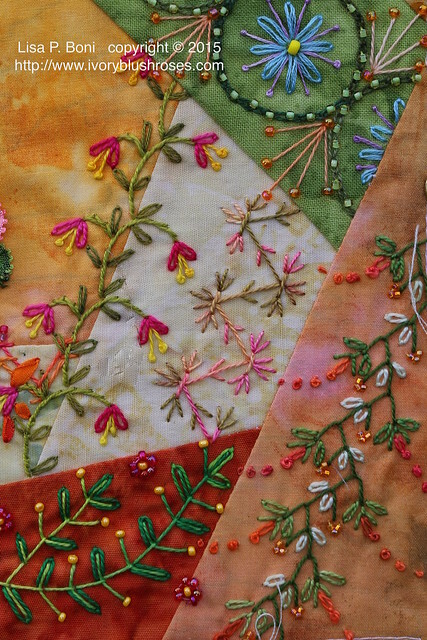 The combination stitch below is one that I found from Sharon Boggin's blog. It took me a while to figure it out, but it is layered with herringbone, chevron, straight stitches and has added fly stitches, lazy daisies and bouillon stitches. For the central motif, I wanted to add some more of the little Mokuba ribbon flowers and also some leaves. I just love using this ribbon! 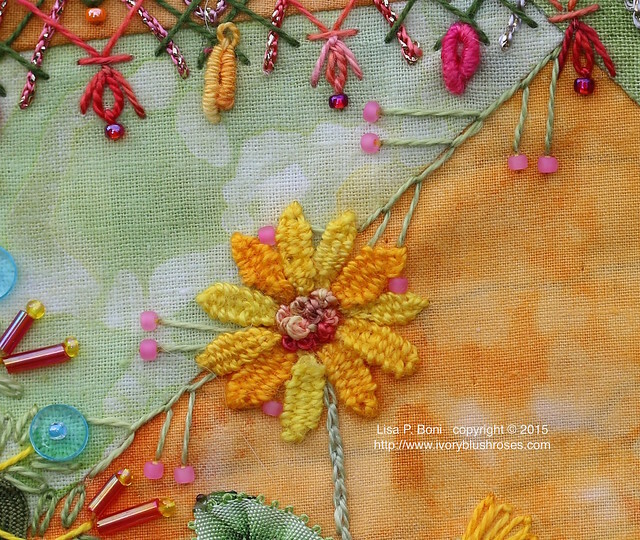 To finish it off, I added a needle-woven sunflower type flower. It's a little simpler motif than some of the others that I have done, but it still balances well with the rest of the blocks! The colours make me think of sherbet and so now I'm hungry!! Wonderful block Lisa. Oh my goodness, so much to study and learn from in this block. Your work as always is exquisite. Thank you for sharing your lovely talent here with us. tu post me deja sin palabras, tus puntadas mágicas y muy bellas, saludos desde España. So very lovely. Your blocks are just amazing. 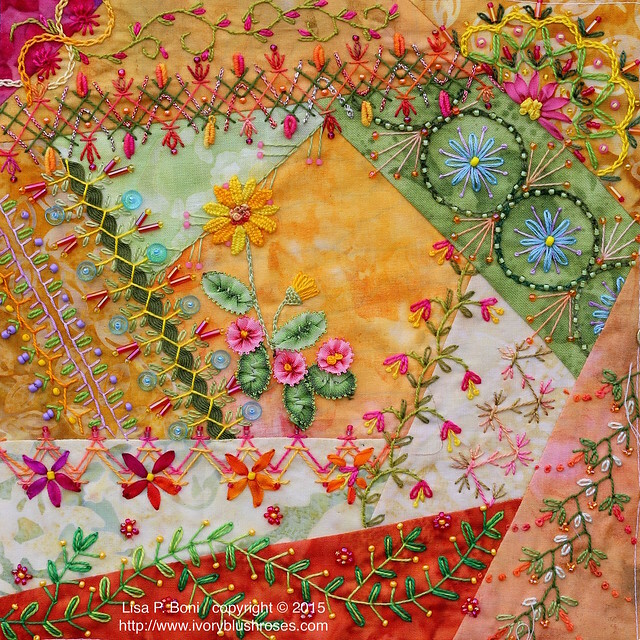 This is so beautiful Lisa, I love how you brought out the pinks through all the detailing you did. Your work never ceases to amaze me, and this is another prime example!! Such a pretty block! I love all the stitch combos. What a beautiful piece of work. Thanks also for taking the time to describe the stitch combinations and why you chose certain colours etc. SO beautiful, Lisa!!!! Always love your work. Gorgeous colors and workmanship as always! I love seeing what you're up to. I love every inch of this block! The way you've layered many of the seam treatments is so unique, unusual, bold...I've never seen those stitches combined like that before and I could look at them for hours! 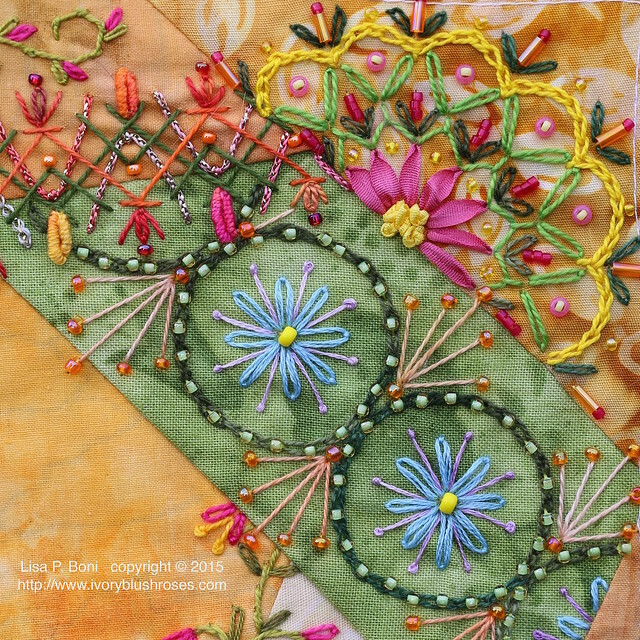 One reason you are behind, my friend, is because you're embellishments have so much depth and complexity it must take you forever to stitch, not to mention design. I am truly a big fan of your work!! I love your creations. The colors are wonderful. Thanks for sharing. This block and your fabulous stitching just boggles my mind. It's beauty is overwhelming. hard to choose, so I will simply say, it is all splendid Lisa . . . This block is stunning! So much detail and I love how you explained some of your stitching and color decisions. I do hope that you'll come join in the fun!